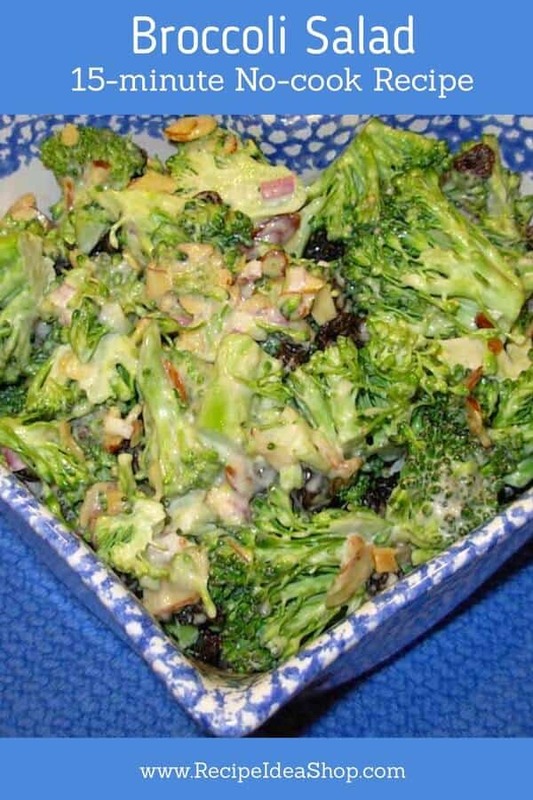 Broccoli salad is a delicious, crunchy salad that is good anytime of the year. Ready in 15 minutes. 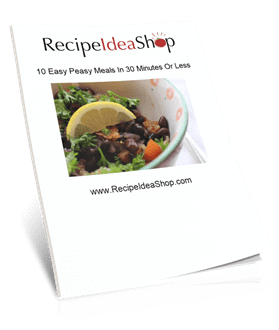 Good for supper or a potluck dinner. 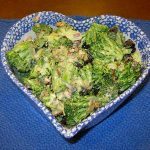 Broccoli Salad is quick to make and a favorite in our house. Hi. It’s Lois in the kitchen at Recipe Idea Shop, with a delicious Broccoli Salad recipe. 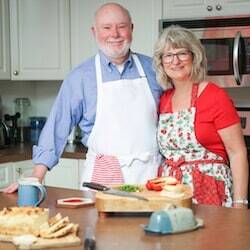 This recipe originally came from Don’s mom, Momma Betty, and it is our daughter Roni’s favorite salad. It’s a good “covered dish” to take to a potluck dinner. I made it yesterday to take to Valley Friends Meeting (Quakers) today because Meeting was having a special speaker after Meeting for Worship. Broccoli Salad is easy and quite tasty. I often buy the precut bags of broccoli at Costco. That makes it super simple. It does have a good bit of sugar and mayonnaise in it, like any old-fashioned Southern recipe. Recently, however, I made it with just 1/8 cup of sugar and I couldn’t tell the difference. Some people make it with crumbled bacon added. That sounds delicious to me! Well, you need some knives, a cutting board and measuring cups and spoons. And a beautiful dish to serve it in doesn’t hurt! Michel Design Works Melamine Large Serving Bowl, Lemon Basil. Buy it on Amazon. Terracotta Orange, Deep Dish – Hand Painted From Spain. Buy it on Amazon. Easy Broccoli Salad. Just chop and mix. 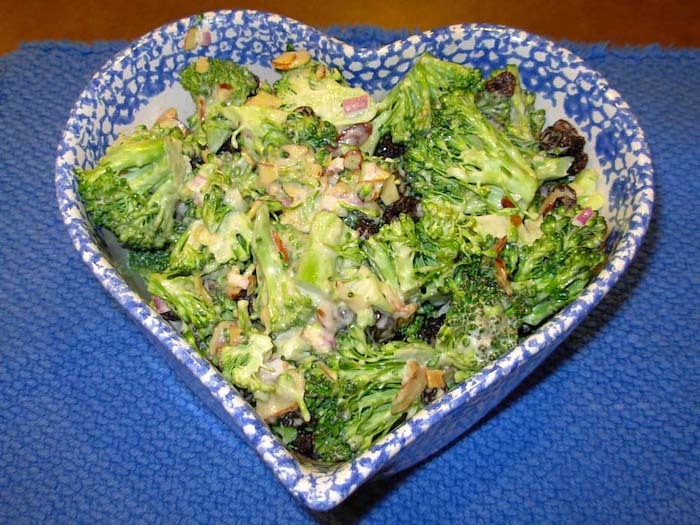 Mix the broccoli, onions, almonds and raisins until combined. In a separate bowl, whisk all of the dressing ingredients until smooth. Pour the dressing over the broccoli mixture and mix to combine. Serve immediately or refrigerate to serve later. 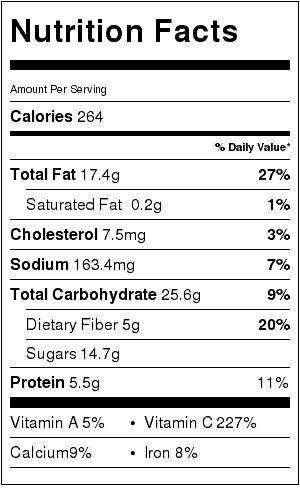 Broccoli Salad Nutrition Label. Each serving is about 1 cup.